Favorable patient outcomes coupled with patient safety has been the major focus of several healthcare facilities since several decades. Moreover, the reputation of healthcare facilities is in stake in case its patients suffer from infections owing to improper or inefficient facility operations. This aspect has fuelled the use of sterilization wrap across various healthcare facilities such as hospitals and clinics. According to studies, sterilization wrap are a better and convenient solution against infections. Not only patients, but also the staff members or care takers of the facility are benefitted by these products. The main purpose being effective infection control, several players involved in sterilization wrap production have come up with new innovative wrap, for instance, developments such as enhancements in microbial barriers, improved resistance against lint, tear, abrasion and flame and better liquid repellent properties. This has triggered the adoption of sterilization wrap, thus contributing to the growth of the global market for sterilization wrap across the globe. Transparency Market Research (TMR) has presented a global outlook on the market for serialization wrap in its recent research report. The research report on global sterilization wrap market covers all aspects that have a major role in pushing the growth of the market which can be associated with the adoption and sales scenario of sterilization wrap across several healthcare facilities worldwide. The global perspective of sterilization wrap market can support in gauging future market scenario with the assistance of forecast analysis presented in the research report along with current and historical data. According to TMR, the global market for sterilization wrap is expected witness substantial growth during the period of assessment, 2017-2026. 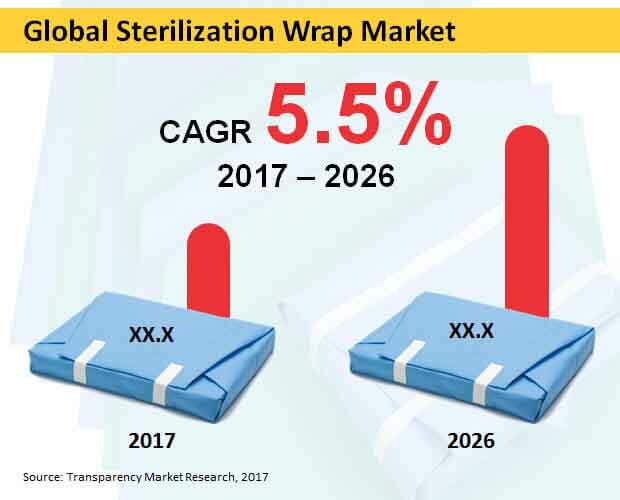 The global sterilization wrap market is estimated to reach a valuation of more than US$ 85 Mn by the end of the period of assessment (2026) and is expected to grow at a robust CAGR throughout the said period. North America region is expected to show high market attractiveness index for sterilization wrap in the coming years. The region’s lucrativeness is mainly pushed owing to increasing use of sterilization wrap in United States and Canada. US is the main contributor for growth of these products in North America. As per analysis, the sales of sterilization wrap in US is expected to cross US$ 25 Mn by the end of the forecast period. North America dominated the market in 2017 and is expected to continue with the status quo in the years to follow. The increasing adoption of sterilization wrap in this region can be attributed to the growing number of healthcare facilities in the region and increased awareness regarding infectious diseases coupled with growing concerns regarding personal hygiene. Sterilization wrap market in Europe is expected to be the second largest with respect market value during the forecast period. Hospitals and clinics are few of the end users that have shown increasing adoption of sterilization wrap since past several years. In the end user category, hospitals segment is expected to be the most lucrative as it is expected to highly contribute to the revenue sales of sterilization wrap. This segment is expected to lead the global market. Moreover, the hospitals and clinics segments are projected to grow at the same CAGR of 5.6% throughout the period of forecast, 2017-2026. The analytical research report on global sterilization wrap market presents a complete intelligence package by providing incisive insights on key players involved in sterilization wrap. Major players such as Halyard Health, Inc., Cardinal Health, Inc., E.I Dupont De Numours and Company, Robert Busse & Co., Inc., Cygnus Medical L.L.C., and Dynarex Corporation are profiled in this research report. Transparency Market Research has revealed various facts pertaining to sterilization wrap in its recently published research report on global sterilization wrap market. This research study is filled with incisive market insights and essential acumen and reflects various factors that have contributed to the growth of the global market. Along with the past market scenario, a glimpse of the future of the sterilization wrap market is also provided. The forecast analysis if for nine years, from 2017 to 2026. This can assist the reader in slating important strategies based on present market conditions to achieve expansion in the coming future. Research study on sterilization wrap market puts forth a global 3600 perspective. Main geographies across the entire globe are assessed and the trends, developments, opportunities, drivers and challenges in each region and sub region that have an influence over the growth of the market in the respective region are studied to get a clear picture of the global sterilization wrap market. Revenue pockets can be derived with such kind of intense market intelligence which is unbiased in nature and purely market centric thus portraying a global perspective in front of the reader. Transparency Market Research follows a one of a kind research methodology to glean vital and relevant market insights. This research process ensures delivery of statistical data without errors, thus maximizing the accuracy of the research report. Secondary research in combination with primary research gives a clear market understanding based on which key players, market observers and opinion leaders are interviewed to check the reliability of the data and to add other facets of the market. The uniqueness of this research process is the revalidation and re-evaluation of the data that takes place at each step during each interview and is continued till the conclusion of the market research. Based on these vital acumen, key analysis can be drawn and recommendations from domain experts are included in this intelligence report. The multiple cross checking of the data ensures a highly accurate market scenario which can be directly used by the reader to chalk informed decisions. The global research report on sterilization wrap market includes an in-depth analysis on each segment of the market. The market segmentation covers product type, end user, sales channel and regions. The research report on global sterilization wrap market covers analysis on key companies dealing with sterilization wrap. Various aspects such as SWOT analysis, key developments, innovations, product portfolio, financials and company overview are included in this section of the report. The reader can gain intelligence on the major players that have a good hold in the market, based on which new strategies can be devised to gain an edge on the competition. The weighted market analysis on global sterilization wrap market delivers value to the reader by providing drinkable insights, ready to use statistical analysis and recommendations without biasness in order to plan future expansion strategies and also to gain stability in the changing dynamics of the global market.